What to do next after Google AdSense application was approved? What to do after Google AdSense application was approved? This question is coming after we got notification of Google AdSense approval. Google AdSense approval is quite long process. A new blogger usually are focus on the Google AdSense approval process. In many cases, blogger are stumbled in the notification that said "We're working on setting up your Google AdSense account...". What to do after Google AdSense application was approved? In this article i would like to share the process that follow Google AdSense approval. After Google approved out AdSense application there are some path that we need to take before we get our first cash our from Google AdSense. My Google AdSense application has been approved last October 2017. The list below showed the action that i dd following Google AdSense process to earn money from Google AdSense. Google AdSense is an ad program. We need to set up some ad in our blog. It is very easy step in Google AdSense. We can set up the ad on the sidebar, header, footer, in article or other ad unit option. Google AdSense has some option regarding the ad design. One things need to consider is the Ad Placement should not violate the Google Policy. It is amazing to see that our blog start earn some money from the advertisement service. We can check the earning status real time. We also can monitor the ad unit performance. Which ad unit that performs better than the other. What blog that generate more income. Google AdSense provide the amazing monitoring dashboard for ad performance. In this stage we will realize that the things that really matter for our income is click on our ad. To earn money we need to get click, To get the click we need traffic. To get traffic we need quality posts. We will observe that the cost per click every ad are vary. If we put some attention to our ad performance, we will also observe that when the sales event occurred, our income will also increase. To earn money we need to get click, To get the click we need traffic. To get traffic we need quality posts. It is amazing to see this thing is actually working for beginner like me. I see the opportunity to grow the audience, get more visitor , get more click and earn more. However it will not an easy job. In fact, it still another long and winding road. It could be another roadblock in Google AdSense. I thought that the Google AdSense approval is the hardest part, i was wrong, increasing traffic is the hardest part. If you are a newbie and want to blog for your life and leave current job, just wait a little longer after you can earn more and stable. Google AdSense are using manual method for address verification. After certain amount of earning around $ 10, Google will send us a notification letter contain PIN Code for address verification. It will takes 2-3 weeks for the letter to arrive into our address. The letter contains 6 digit pin that we need to put on Google AdSense verification address. Please noted that we only have 3 times chance to put the correct PIN. Just make sure you don't miss this. The mistake in this step can make our Google AdSense suspended. I join the Google AdSense program in 2017 Oct. Luckliy Google AdSense support local Bank in Indonesia. After address verification we need to put our bank account for the payment method. Google also use manual verification in this step. Google will transfer certain amount of money less than $ 1 to our account and we need to get this number for bank account verification. After that, our bank account will be ready to be used for Google AdSense payment. The minimum payment treshold for Google AdSense is $ 100. This will be the first paycheck for most of Google publisher. But it will depend on our blog traffic, visitor and the advertisement click. We need to read Google policy and make sure that our blog is safe from policy violation. Google will conduct random audit in our blog. If they found any violation, they will send notification for page level enforcement or even account level enforcement. I will discuss about this latter. I got one email notification for page level enforcement. The list above are the things that i do after my Google application was approved. How about you? Please let me know in the comment section. Sharing is caring. 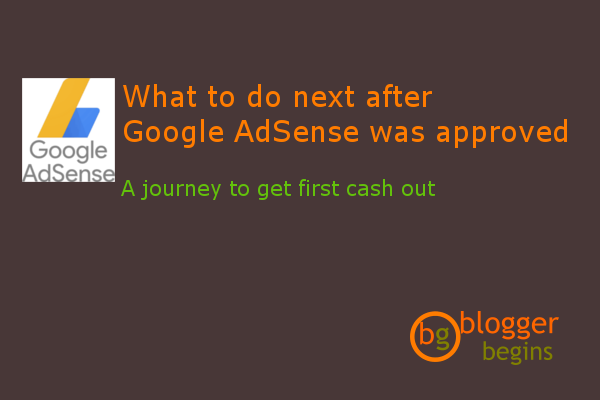 3 Responses to "What to do After Google AdSense Was Approved"